The Greater Lawrence Sanitary District (GLSD) in North Andover, MA, was one of 28 organizations nationwide to be honored for an innovative water or wastewater project in the most recent PISCES Recognition Program sponsored by the Clean Water State Revolving Fund (CWSRF). PISCES stands for Performance and Innovation in the SRF Creating Environmental Success. The utility’s Organics-to-Energy project is designed to generate biogas from its sludge treatment process and lead the wastewater treatment facility to energy independence by the end of 2018. The project also provides practical support for the state’s commercial organics waste directive. The Organics-to-Energy project evolved as a result of the 2014 Massachusetts Department of Environmental Protection (MassDEP) ban on landfill disposal of commercial organic and food wastes. The ban targeted larger businesses and institutions — those that generate more than one ton of such materials per week — including supermarkets, catering operations, and food processors. GLSD’s plan was to blend source-separated organics (food wastes) with processed sludge from its own plant to feed anaerobic digesters capable of holding up to 1.4 million gallons of sludge each and of generating 400,000 cubic feet of biogas (methane) per day. 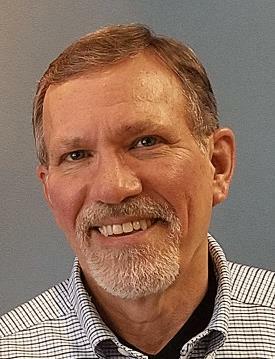 The GLSD plant already had three of those anaerobic digesters creating biogas from sludge alone — enough to power the boilers that generated heat for the digesters’ heat exchangers and to heat the facility’s buildings as well. 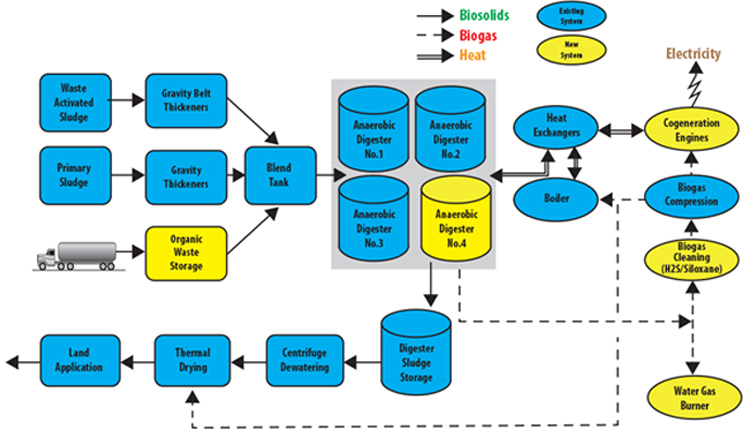 The Organics-to-Energy project added a fourth anaerobic digester, plus two biogas-powered cogeneration engines, to provide additional BTUs for the heat exchangers that support the anaerobic digesters (Figure 1) and to generate electricity. GLSD already uses a solar panel array to produce more than 580,000 kilowatt-hours of electricity annually to defray its electricity costs. 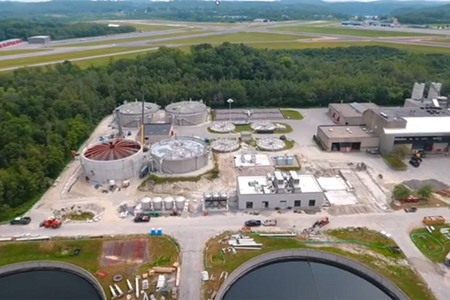 With the addition of the new biogas–powered electrical generation capability, the goal of the sanitary district is to become a net-zero-energy facility by the end of 2018. Figure 1. The GLSD Organics-to-Energy project upgraded an existing biogas-to-heat process with added ability to generate electricity and to help support the state’s ban on commercial food wastes in landfills. The utility capitalized on $6 million in state grants and a $24-million loan from the CWSRF to bring the project to fruition. By the time the plant becomes fully operational in the latter part of 2018, it is intended to accept 92,000 GPD of organics and use that material to generate up to 3 megawatt hours (MWh) of electricity onsite annually. The project is expected to reduce the utility’s carbon footprint by nearly 4,000 tons per year. It is yet one more example of how one person’s trash can be another’s treasure.